Rutman, D. (2016). Becoming FASD-informed: Strengthening Programs and Practice Working with Women with FASD, Substance Use: Research and Treatment, 10, (S1), 13-20. doi: 10.4137/SaRt.S34543. Rutman, D., Poole, N., Hume, S., Hubberstey, C. & Van Bibber, M. (2014). Building a framework for evaluation of FASD prevention and support programs: A collaborative Canadian project, International Journal of Drug and Alcohol Research(3) 1, 81-89 doi:10.7895/ijadr.v3i1.122 . Rutman, D. & Hubberstey, C. (2011). Knock, Knock, Who’s There…for Youth? The Experience of Support When Aging Out of Foster Care. In K. Kufeldt & B. McKenzie (Eds), Child Welfare: Connecting Research, Policy and Practice, Second Edition. Waterloo, ON: Wilfrid Laurier University Press. Rutman, D. (2018). FASD-informed approaches: Strengthening practice and programs working with children, youth and adults living with FASD. Presentation at Eusarf 2018 Porto – XV International, Porto, Portugal, October 2018. Rutman, D.,Hubberstey, C. & Poole, N. (2018) Evaluation of HerWay Home: Promising approaches and outcomes of an FASD prevention program for substance using women with complex issues. Presentation at the 4th European conference on FASD, Berlin, September 2018. Rutman, D. &Hubberstey, C. Demonstrating the value of support for former youth in care: How evaluation informed program planning and implementation, and advocacy for systemic change related to youth who age out of foster care Presentation at the Canadian Evaluation Society conference, Vancouver, BC, May 1-3 2017. Rutman, D.,Hubberstey, C., Poole, N. & Seymour, A. Phase 1 Evaluation of HerWay Home: Evaluation Highlights, Promising Approaches and Lessons Learned. Poster presentation at the 7th International Conference on FASD: Research: Results and Relevance Integrating Research Policy and Promising Practice around the World, Vancouver, BC, March 1-4, 2017. Rutman, D. & Hubberstey, C. (October 4, 2016). Fostering Success: Improving Educational Outcomes for Youth in/from Care. Invited Webinar presented to PART (Practice and Research Together). Rutman, D., Hubberstey, C., Hume, S., Van Bibber, M & Poole, N. (October 2014). Evaluating FASD prevention and support programs: How value-based program evaluation supports planning, practice, and program implementation. Paper presentation at 3rd European Conference on FASD, Rome Italy October 20-22, 2014. Rutman, D., Poole, N., Hume, S., Van Bibber, M & Hubberstey, C. (October 2012). Toward an Evaluation Framework for Community-based FASD prevention and support program. Poster presentation at 2nd European Conference on FASD, Barcelona October 20-22, 2012. Rutman, D. (2011). 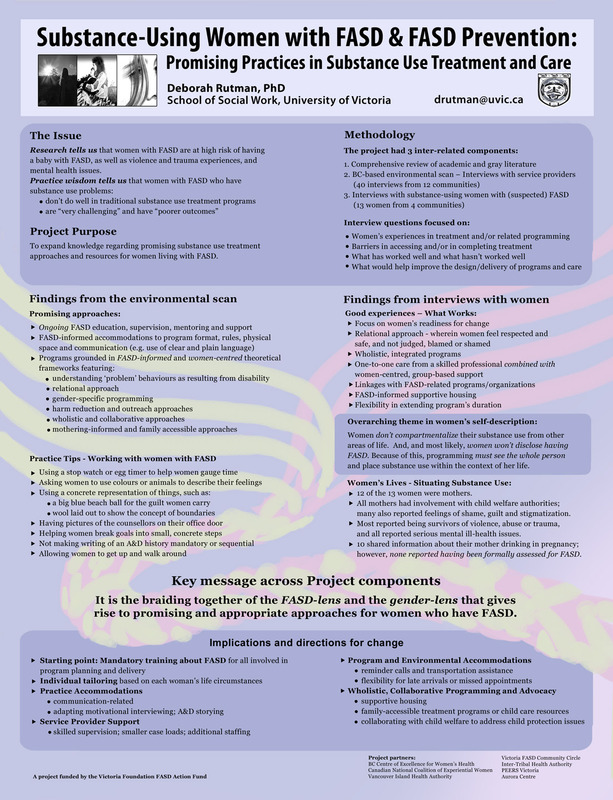 “Substance Using Women with FASD and FASD Prevention: Promising Practices for Substance Use Treatment and Care” Poster presented at Issues of Substance conference (national conference of the Canadian Centre on Substance Abuse), Vancouver, BC.